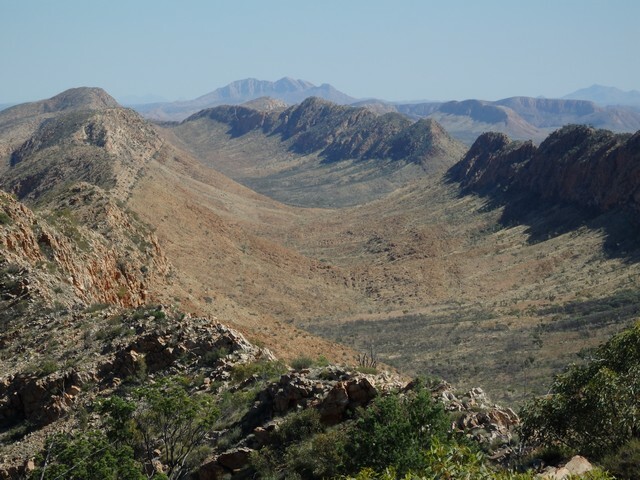 Sitting on the mini-bus from Alice Springs out to Redbank Gorge – I’m walking the Larapinta Trail west to east starting at section 12 -and staring at the imposing peaks and ranges that comprise the West MacDonnell National Park; I wonder what the next 17 days will bring. Already it’s had surprises. 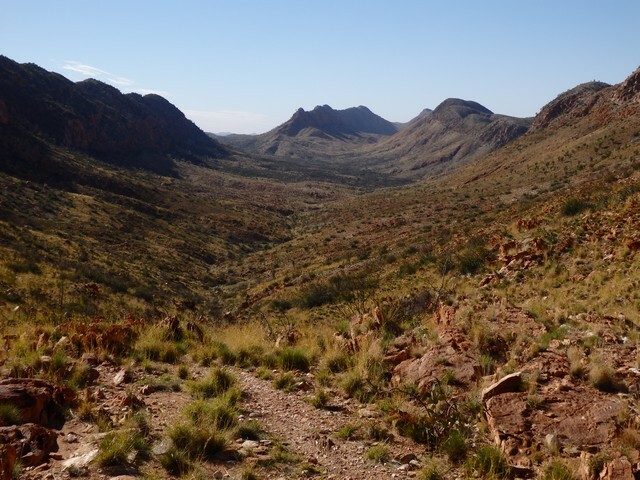 The 223 klm Larapinta Trail winds its way through the West MacDonnell National Park west of Alice Springs. Quickly gaining a reputation as one of Australia’s best multi-day walks and even one of the world’s best arid zone walks. 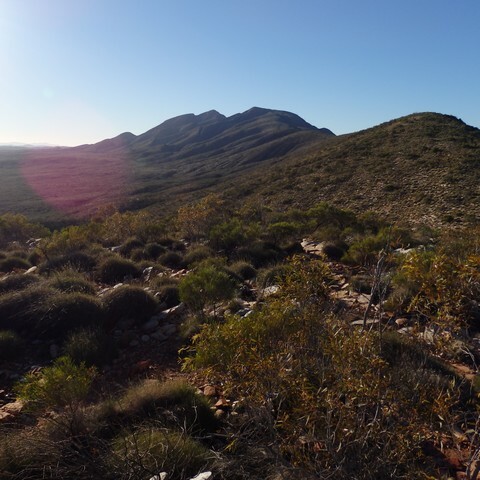 During the short May to August peak period, many tackle the Larapinta Trail – either independently or with a tour group – in its entirety or sections thereof. 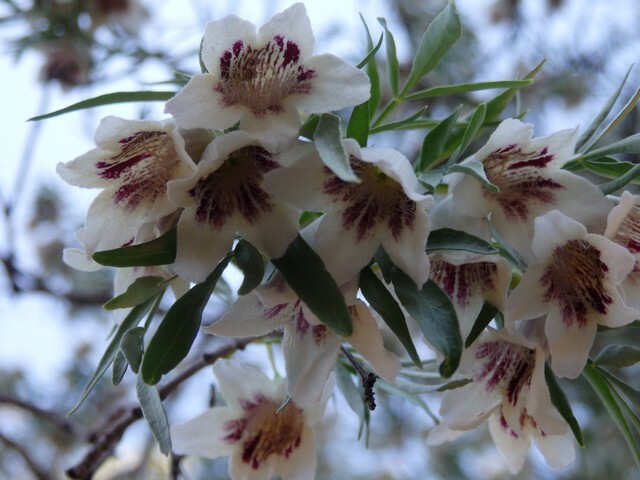 Redbank Gorge offers two highlights. 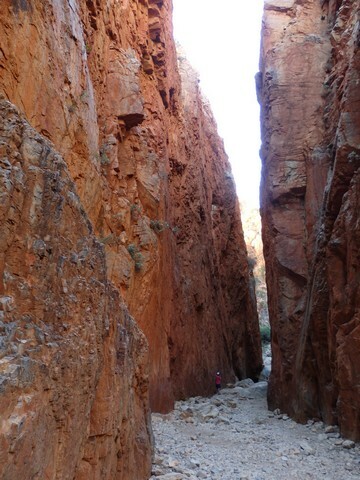 The gorge itself with two incredibly high sheer walls faced with a deep red rock. Both walls only a few metres apart, separated by deep clear water, before opening out onto a small sandy beach. The gorge offers a couple of formidable defences against one’s temptation and curiosity to see what lies beyond the first bend. The sheer walls would surely turn back all who attempt to climb or scramble through, leaving the seemingly easy and inviting swim option. However the incredibly frigid water keeps intrusions to a minimum. A nearby sign warns of the quick onset of hyperthermia should anyone attempt the ‘swim through’. Redbank Gorge is also the commencement point for the arduous 16 klm return walk to the summit of Mt Sonder. 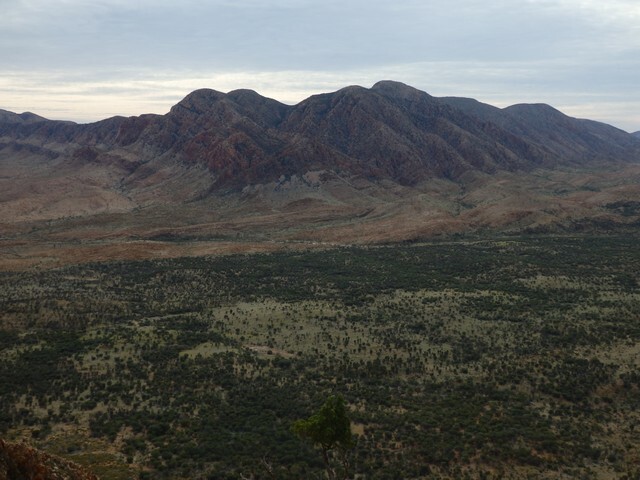 On arrival at the summit – and the highest point on the Larapinta Trail – one is rewarded with a 360 degree vista surrounding this grandiose peak. 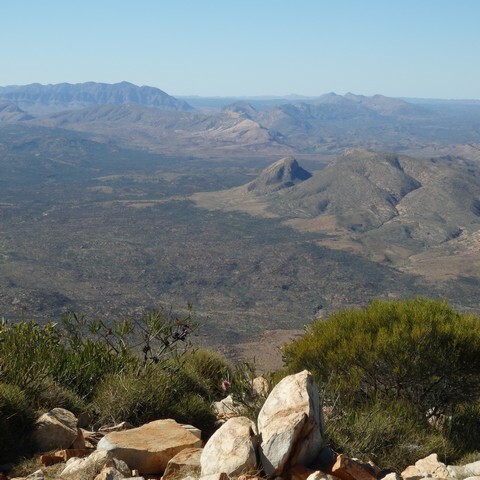 From the summit, Mt Zeil – NT’s highest peak and also the highest peak on the Australian mainland west of the Great Divide – dominates the western skyline. Looking east across the Heavitree and Chewings ranges, snaking towards Alice Springs, I try to guess where the trail will take me in the ensuing days. Returning from the summit in the early afternoon, I briefly submerge myself in the aforementioned freezing water, before packing up camp and starting for the next campground at Rocky Bar Gap. I arrive shortly before sunset, totally exhausted. It’s been a 30 klm day, including the climb to Mt Sonder. Leaving Rocky Bar Gap early, I’m rewarded with a stunning view of the east face of Mt Sonder, as it reflects the early morning light down onto the surrounding plains over which it dominates. As the trail climbs to the nearby aptly named ‘hilltop lookout’, I continually look back at the changing light and colour of Mt Sonder. The sun’s heat is becoming more evident as I begin the steep descent down from the lookout, even worse as I cross the open flood plains of Davenport Creek and the Finke River. 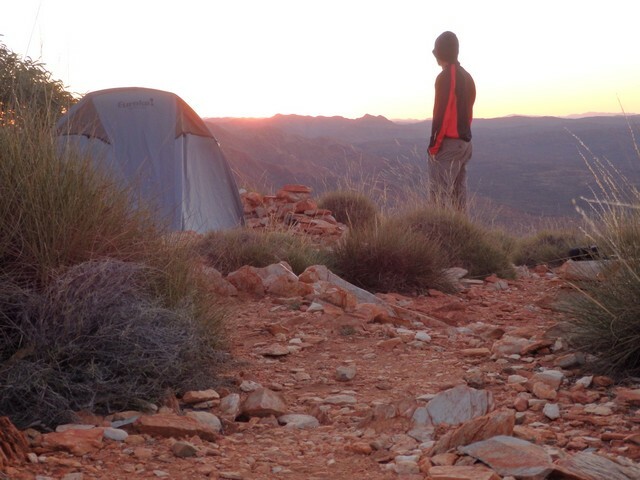 Camp for the night is at a purpose-built shelter for trail walkers – no need for tent – on the west bank of the dry Finke River. An adjacent hill offers superb sunset and sunrise photo opportunities. The hotter days bring with them some unwelcome companions – flies! Not just a gazillion of the garden variety type, but also biting march flies. Then an hour before dark mozzies come out to join the party. The nights are still cool to cold, the temperature drop noticeable around an hour after dark; rolling in like an invisible fog and sweeping away the mozzies as it passes, leaving one with some blissful insect free time. 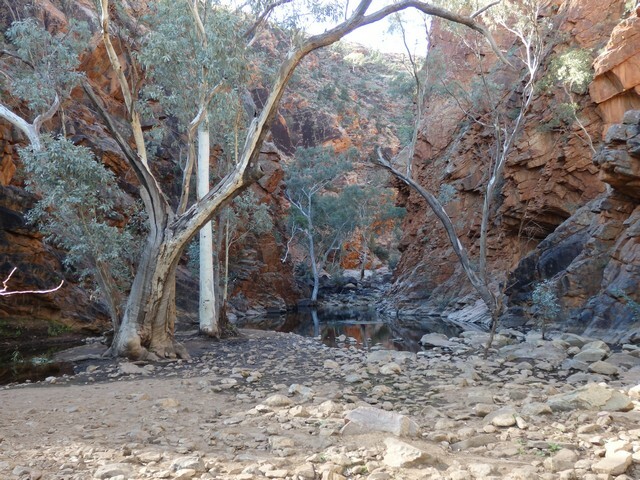 Section 10 is an easy 9 klm walk to Ormiston Gorge, where awaits a beautiful kiosk with beautiful cold drinks, beautiful toasted sandwiches, beautiful showers….and a beautiful waterhole. An ideal place to spend a hot afternoon. I decide against doing the Ormiston Pound circuit walk. It seems that the long first day has come back to bite me, with several toes sporting large painful blisters. Not ideal this early on the trail, hoping they don’t deteriorate any further. 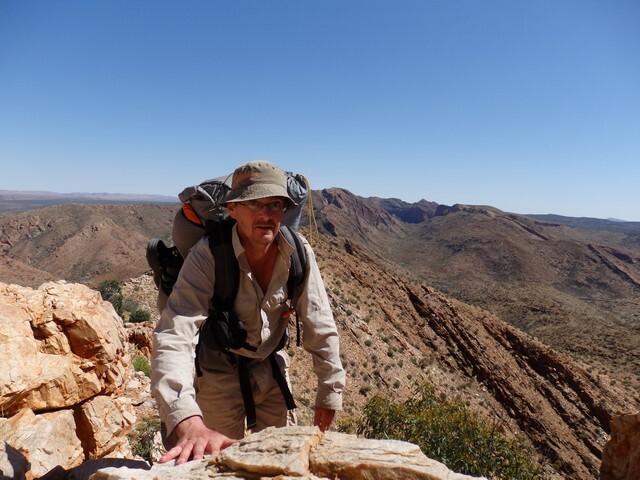 Aside from the creeks and gullys, the easily broken and sharp shale like rock of the West MacDonnell Ranges is a constant presence on the trail, and a test for ankles and footwear alike. The 4 klm traverse along the rocky, stone littered ridgeline is slow and tedious, but rewarded with terrific views in all directions. 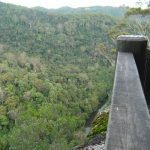 A very steep, stony descent separates me from the lookout and the creek far below, before a short rock hop up the creek to my campsite at Waterfall Gorge. An afternoon spent relaxing in the shade hiding from the energy sapping heat of the sun overhead. Exiting my tent the following morning, I’m grateful to feel a change in wind direction and the promise of a cooler, albeit still very warm day. Today is relatively easy, with little elevation or vegetation as the trail follows a valley between two high ranges that rear up either side. Then a rock scramble through Inarlanga Pass, before arriving at Serpentine Chalet Dam. On the trail budgerigars are regularly seen and heard, they seem to congregate in small flocks of 10-20. Taking a break atop a saddle in the shade of a lone tree, a flock flew in my direction. With the wind assisting them, these green missiles split either side of me, so close I could feel the wind from their wings. I spun around in shock, then laughed at their cheeky ‘fly by’. I pitch my tent in the riverbed shaded by several red rivergums alongside another solo hiker heading in the opposite direction. Our conversation distracts us from the huge number of flies and mozzies who want to share our serene surroundings. Anticipation is high as I leave Serpentine Chalet Dam. Not so much for the steep climb ahead, but for what awaits at the top. Counts Point! 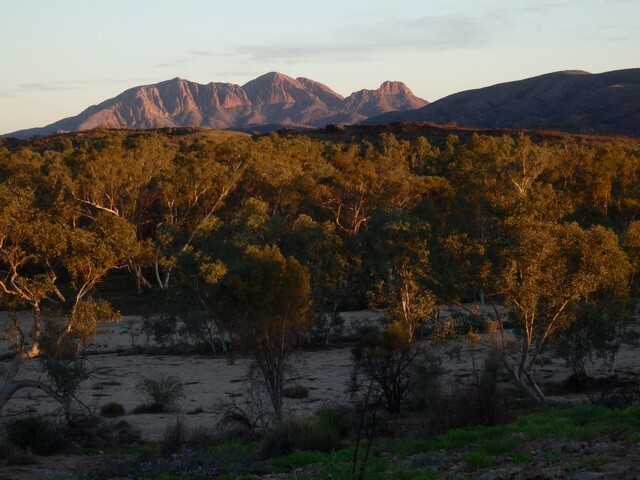 For it is here that one is not only rewarded with a supreme view, but also that quintessential photo of the Larapinta Trail, the photo you’re most likely to see on brochures or marketing for the trail. As I gaze further to the west, I note that Mt Sonder is now becoming a distant memory. This perhaps even my last glimpse? 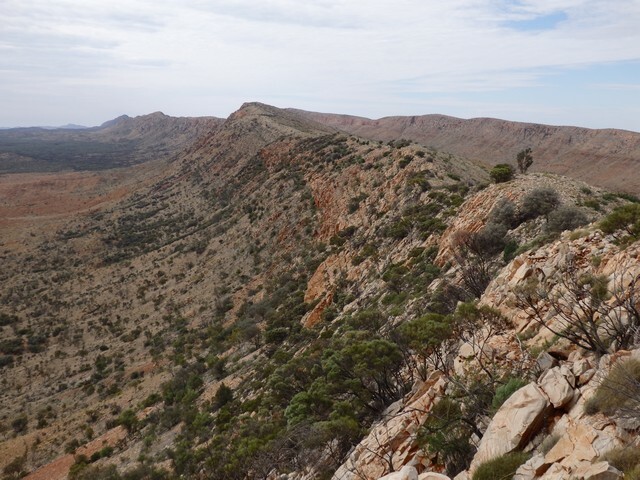 Not unlike two days earlier, I follow a high narrow ridgeline for some time, paramount views my constant companion, before another steep descent and eventually – Serpentine Gorge. I sit at the water’s edge and embrace the quietness – in between conversations with tourists dropping by for a quick photo – very relaxing. Dingoes seem to be an ever-present threat, a constant reminder to keep food with you at all times. At Redbank Gorge, I witnessed one attempting to drag someone’s daypack away! 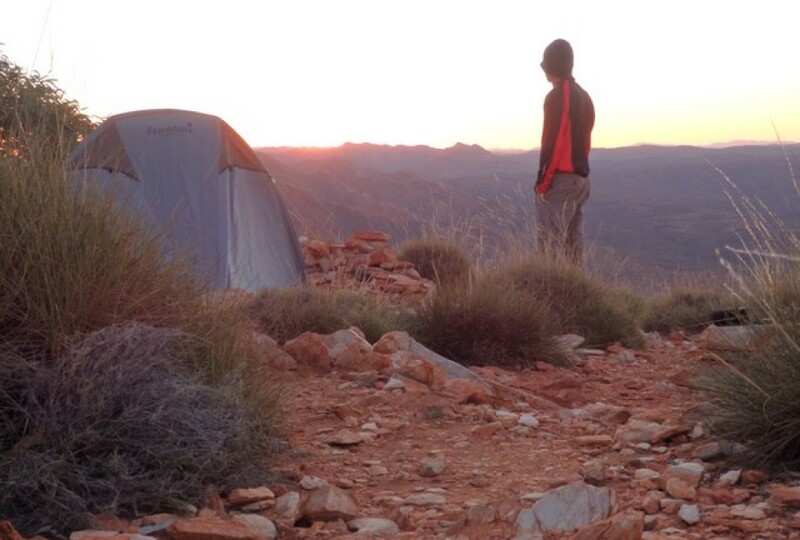 Camping on my own that night at Serpentine Gorge, a dingo howled in close proximity to my tent. Whilst I don’t fear them, certainly gave me the goosebumps as I lay there in the dark. 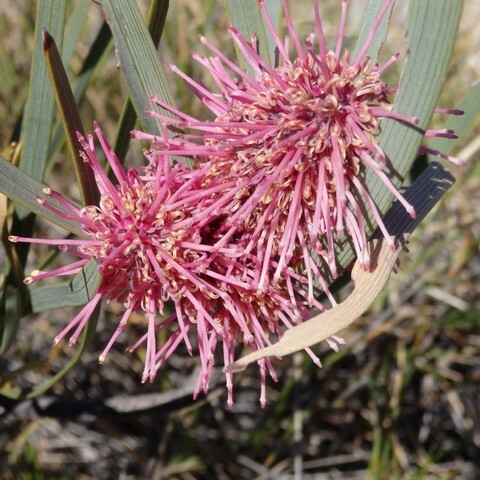 The vegetation and flora on the 14 klm Section 7, is the most prolific thus far on the Larapinta Trail. The spring flowers are emerging. So are the birds; the budgerigars and finches my personal favourites. Combine with temps in the mid 20’s, and all makes for a pleasant days walking. Except for the flies, although the biting march flies have not been seen for a couple of days. 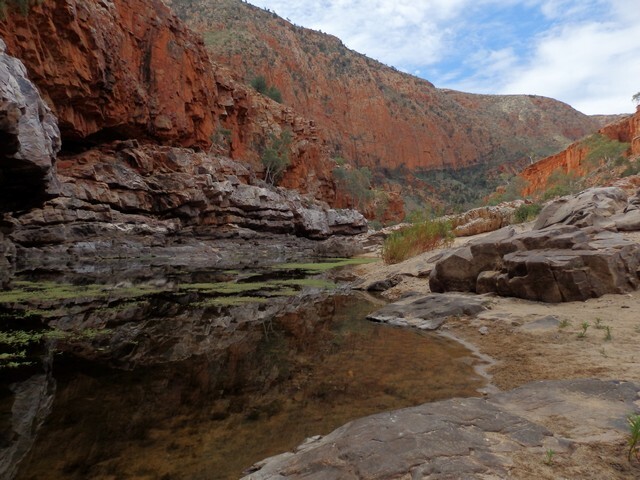 Ellery creek, an oasis paradise and Garden of Eden for those on the trail and the go to place in summer to cool off for Alice Springs locals. Arriving early afternoon, I immediately dive into what is the largest waterhole on the entire trail. As with Redbank Gorge the water is insanely cold. I collect my 2nd food drop and pitch the tent in the campground with others camping in their campervans etc. That evening the decision is made to declare tomorrow a ‘rest’ day. Other than the blistered feet demanding attention and respite, the beautiful location is deserved of a longer stay. My ‘rest’ day will be the coolest day on the Larapinta trail, feels strange wearing long pants and a fleece top all day. During the day, and at night around the campfire, I meet and converse with some fascinating people. I’m grateful for the time at Ellery Creek to socialize, as 3 out of the next 4 nights, I will be camping on my own. In fact, for the next 6 days, I encounter only eight other hikers. 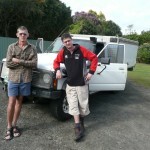 In the morning before leaving Ellery Creek, I say my goodbyes, exchanges of ‘good luck with your journey’ all round. It is here that I also say goodbye to the Heavitree Range. The 31 klm section 6 is easier walking, diagonally crossing the vast plain that separates the Heavitree and Chewings Range. 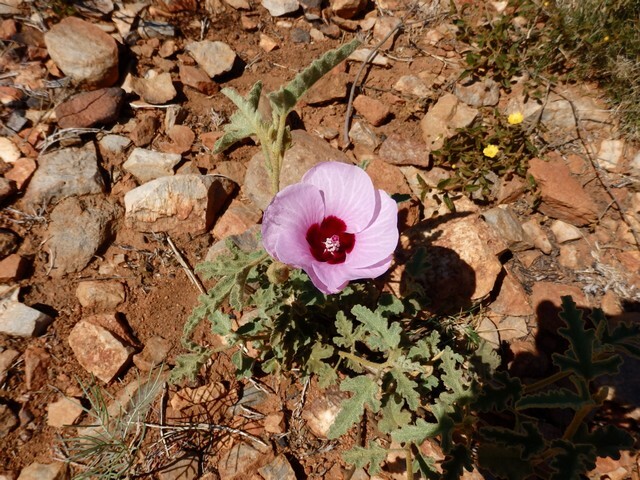 Once entering the plain, what is most noticeably apparent is the absence of spinifex – sharp, skin piercing, unforgiving, step off the trail at your own risk – spinifex. Replaced instead with grass – soft, can touch it without cursing – grass. 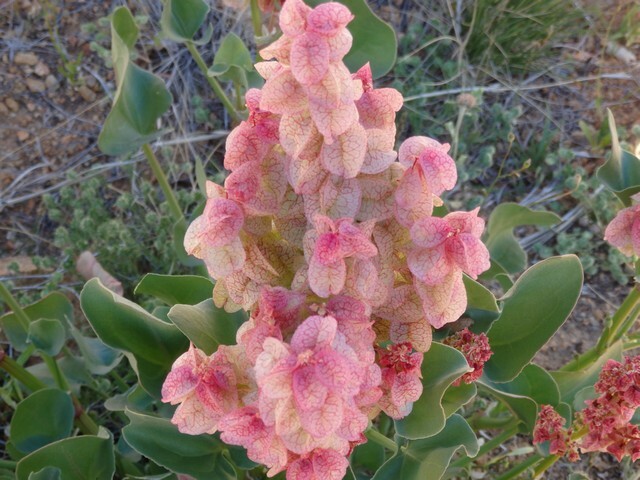 The spring wildflowers are far more prolific, in places like a garden. 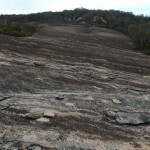 I arrive at Rocky Gully camp – halfway across the plain – around 2pm. If feels too early to call it a day, I’m keen to continue, but mindful of the feet, I stay. Continuing the next morning and nearing the other side of the plain, the Chewings Range begins to dominate the skyline, promising a tougher test ahead. There’s a brisk cool breeze blowing today, making for ideal walking conditions, with a mutual benefit of keeping the flies away. Feels so good to not have one hand constantly waving at your face like a vehicle windscreen wiper. I reach Hugh Gorge campsite early afternoon, but based on the recommendation of others, I’d already decided to push on to Hugh Gorge Junction camp. I take the opportunity to top-up with water and tend to some new blisters. 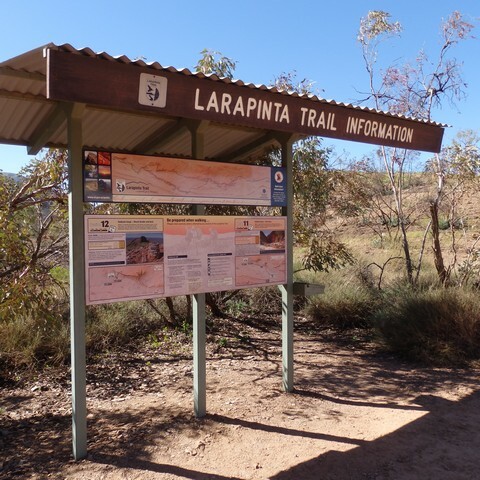 This point also marks the commencement of sections 5 and 4, the only sections on the Larapinta Trail rated as ‘very hard’. The 3.5 klm’s to Hugh Gorge Junction is a tricky, but fun rock hop and scramble up the Hugh River. The river is mostly dry, with the occasional waterhole, both sides of the gorge dominated with massive cliffs. The cliffs are sparsely populated with ghost gums, defying logic sprouting from the bare rock often at bizarre angles. It’s one of the most spectacular gorges I’ve been in and a highlight of the trail. 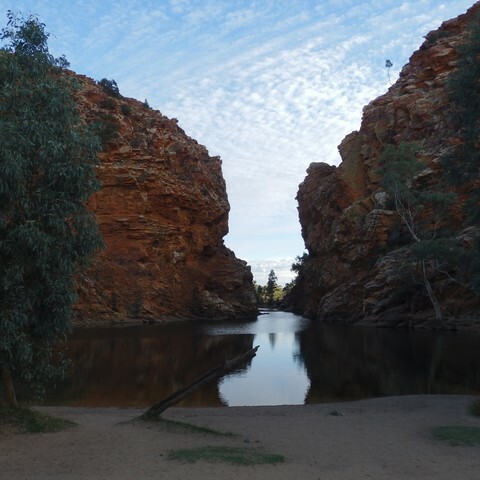 My campsite is on the dry sandy riverbed, shaded by beautiful River Red Gums and almost completely surrounded by the gorge cliffs. A spectacular location where I got that real feeling of the outback. The ancient geography, serenity and isolation; a simple yet rugged beauty found nowhere else. After setting up the tent, I explore further up the gorge, where incredibly the gorge is even more impressive, a photographers dream. Cycads indicating a wetter time, long since passed. As I look up at the cliffs with dusk fast approaching, the silence has an almost overwhelming presence. Especially emphasised here in the gorge, but noticeable virtually the length of the trail. No voices, vehicles – just a vast quietness. The interruption of birds by day and the howl of dingoes by night. With my camp nestled in the gorge, the sun’s morning arrival is delayed. As a consequence, the freezing nights reign is extended for longer than I hoped, as today promises to be the toughest test on the trail thus far. 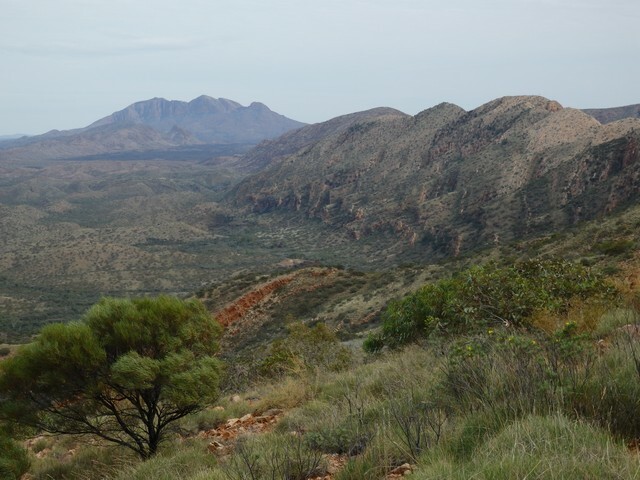 When I traverse nearby Rocky Saddle and sight what will be my possible route over the range into Spencer Gorge, I can’t help but whistle in nervous anticipation. What the day promised, it delivered. The steep climb to Razorback Ridge, from where I traverse a narrow rocky spine, in places only a couple of metres wide falling away on both sides, demanding constant concentration. Paramount views a reward, before a protracted sheer descent on loose rock and long rock hop through gullies and gorges to the river near Birthday Waterhole. The last few hundred metres trudging through sand along the riverbed a cruel finish, a final test for well weary legs and a reflection of the days efforts. The first few nights on the trail, I took advantage of the warmer nights and slept without the tent fly, looking straight up at the night sky. Surrounded by stars, just breathtaking. I’m grateful of this earlier opportunity, as the nights have become cooler – some downright cold – and the moon brighter. Stars aside, for the first time I’ve taken notice of the moon’s cycle. I awake knowing today is only 7.7 klm’s and the first 5 klm’s probably the easiest of the trail. However as I round a bend in the trail, the remaining nearly 3 klm’s makes its imposing appearance – Brinkleys Bluff! Rising abruptly 500m from the surrounding landscape to its 1209m summit. It’s demanding presence and the thought of climbing to the summit has an almost immediate effect, the pack feels heavier – which it is with extra water – the legs buckle and the midday heat intensifies. Before even reaching the first saddle, the views are already impressive. The real test begins from the second saddle, a long slog up a zigzag path cleverly cut into its precipitous face. Over two hours after leaving the river far below, the torture ends as I touch the impressive rock cairn that marks the summit. I stand seemingly on top of the world, spectacular 360 degree views, for a distance that is difficult to comprehend. I pitch my tent, weighed down with rocks thwarting the gusting winds that will arrive in the night and their attempt to send it skyward. As the sun drops low in the sky, I find myself alone at the top, mesmerized by the change in colour from the setting sun on the landscape below me. 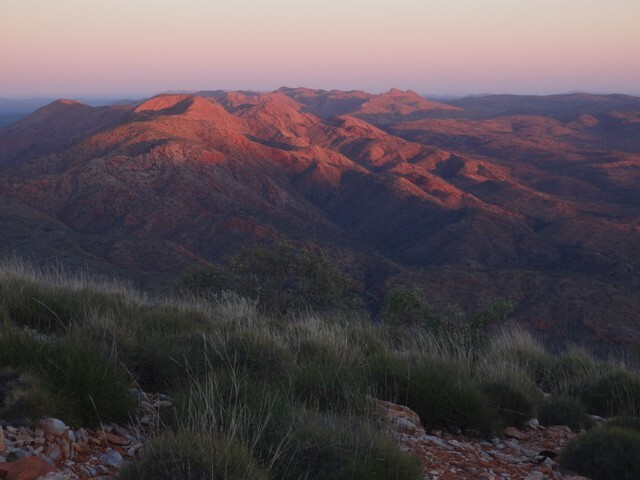 The predominately pink rainbow of colours that paints the sky above the horizon every sunset and sunrise on the trail – not that I saw many sunrises – is even further enhanced from my supreme vantage on Brinkleys Bluff. Could this be Australia’s best campsite? Fighting the cold, I make the rare effort to rise before dawn to witness the reversal of yesterday evenings stunning performance. Soon after, I return to the warmth of the sleeping bag, content with my bedside vista of the Chewings Range. I reluctantly leave my pinnacle campsite, the ridge down from Brinkleys to the east is a complete contrast to its evil cousin on the western side. 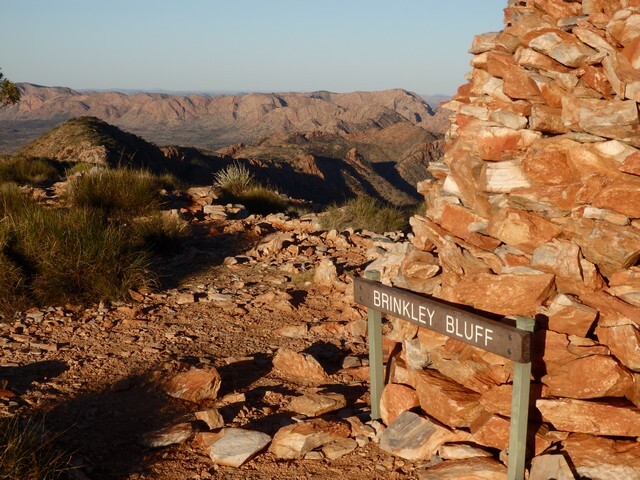 A gradual 10 klm descent offering splendid views virtually all the way to Standley Chasm. As if today couldn’t get any better, Standley Chasm offers a hot shower, grassed tent site, cold drinks and hot food. Glimpsing a weather report promising hot days ahead and feet desperate for respite, I decree tomorrow to be another day of rest. 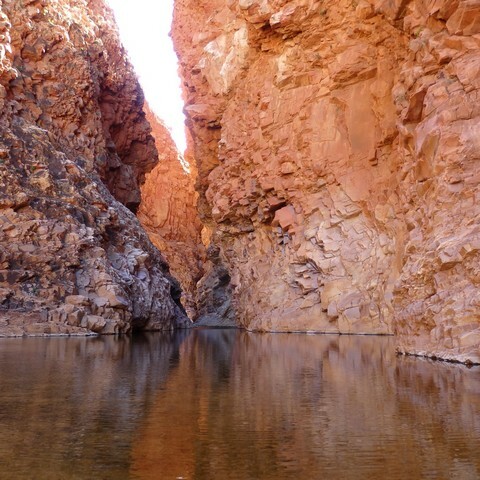 The dry creek bed at Standley Chasm allows one to walk through the narrow ‘chasm’ and marvel at the deep red vertical cliffs that frame this wonder of geology and erosion. Very popular with tourists, especially at midday with the high sun lighting up the chasm. Personally I preferred the late afternoon intimacy, alone to admire the colour and texture of the rock walls. Travelling west, the 14 klm section 3 is rated ‘hard’ and an ideal lead-in to the more difficult sections 4 and 5. However travelling east as I was, it offered little trouble, despite the daytime temp reaching the high 20’s. A perfectly timed arrival at the Fish Hole waterhole in the early afternoon heat, complete with a rock ledge in the shade overlooking the water, was an ideal place to spend a couple of hours. From here, just a short walk to the trail shelter at Jay Creek. Several days ago – despite their distance – I’d made the decision to complete sections 1 and 2 in two days. 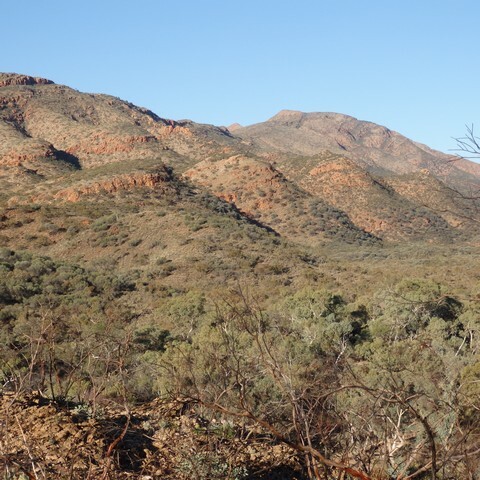 With the West MacDonnell Ranges decreasing in stature approaching Alice Springs and both sections sporting only a ‘medium’ rating, it didn’t seem like a difficult proposition. However the Larapinta Trail still had one trick up its sleeve, one last defiant act that would see daytime temps in the low to mid 30’s! As I pack up camp at Jay creek for the 25 klm section 2, my efforts to leave before sunrise and beat the heat, is frustrated by the cold! At 7.00am and shivering despite wearing three layers, I feel justified in questioning the predicted forecast. A deep clear waterhole at Bond Gap on the eastern edge of Arenge Bluff mercilessly ended my struggle in the afternoon sauna. Providing shade and the usual frigid water for a much-needed, albeit swift swim. 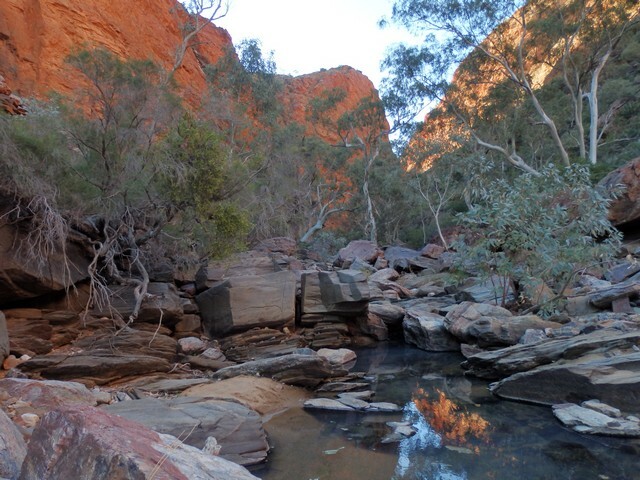 I limp into Simpsons Gap shortly before dusk. It’s the worst I’ve felt on the trail thus far. I’m scares me to think what my feet will look like when my shoes come off. My last night on the trail was considerably warmer, making the early morning rise an easier proposition. The final day promises another scorcher and as if in confirmation, the first of the flies arrive at 6.45am, beating their previous personal best by over an hour. Just over halfway through the 24 klm section 1, the trail rises to atop Euro Ridge and my first sighting of Alice Springs township. It’s also my final opportunity to gaze back at where I’ve walked and reflect on the previous 17 days. So many magical moments and spectacular scenery, including Mt Sonder, Counts Point, Hugh Gorge, Brinkleys Bluff, and the wonderful people who I’ve been fortunate enough to share experiences with. 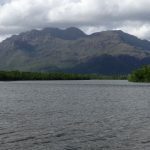 Nor was it without its challenges – the freezing nights and scorching days, blisters and the bloody flies, but that only heightens the sense of achievement gained from completing this walk. The same feeling I have right now. A remote location far from the city crush, but that’s its trump card, a uniqueness all of its own. 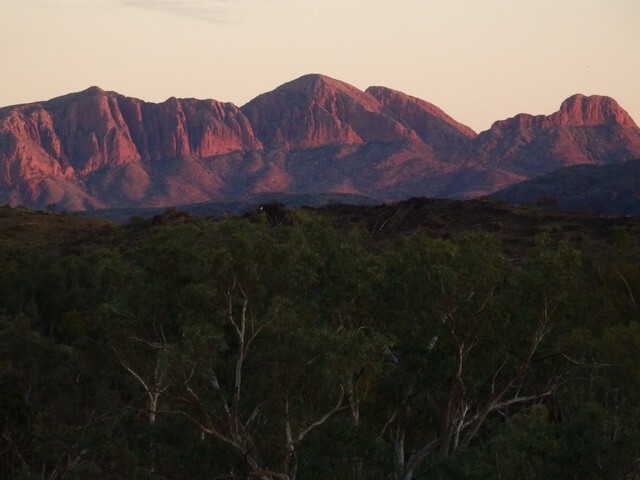 As it says on the NT National Park website and marketing material ….. Larapinta Trail – expand your horizons! 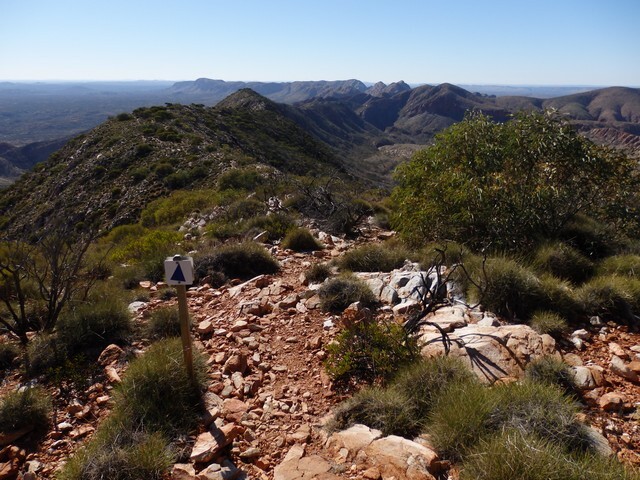 Descending Euro Ridge for the final 12 klm to Alice Springs, the trail seems far more undulating than I imagined, but perhaps my judgement has been clouded by the heat and painful feet. Finally the Alice Springs Telegraph Station comes into sight and as I touch the finish line and sign the log book for the final time, I feel nothing but relief. The sorrow and remorse that it’s all over will undoubtably come crashing back, but only after a shower, cold drink and pizza! 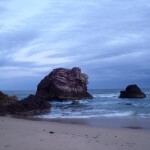 This entry was posted in Multi day hikes in Australia and New Zealand and tagged best multi-day hikes in Australia, best multi-day hikes in Northern Territory, Brinkleys Bluff, Hugh Gorge, Larapinta Trail, Mt Sonder, Ormiston Gorge, Redbank Gorge, Standley Chasm, West Macdonnell Ranges by danthewanderer. Bookmark the permalink. 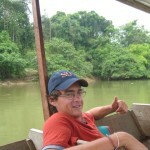 A seriously inviting and well put together account of Dan’s wanderings…. makes me want to go! Heading to Larapinta myself next year Dan. Thanks for your musings – and the warnings about flies! Great article dan! I see its not utter madness to try it solo… im planning going in july. Thanks for posting ur experience and causing motivation rise! It’s a beautiful walk, very easy to do solo & you can just cruise along at your own pace :-). Enjoy the walk, let us know how you go. Hi Nice post, Thank you for sharing such a beautiful post keep it Up, Waiting for the Next Update. Can I ask did you prepare for blisters before the trip – with sock liners, wool socks, taping etc. and still got them? Or did you give it a red hot go and they just happened. No preparation was one of my first long walks, & whilst the Larapinta is hard on the feed, I put it down to cheap shoes & socks. Now always use wool based socks & Saloman shoes and so far haven’t really had a problem.